If you’re anything like me you’re not the most organised person on the planet. I don't often plan ahead, and have difficulty sticking to routines. The same goes for my dog. We don’t have a set routine for feeding, walking, or bed-times, and yet she is a happy, healthy dog. Despite this mostly unstructured approach, there is one thing I do prepare for in advance. I am always ready for a spontaneous outing with my dog. Rather than having to think about what I need to take with me, I have it all ready to grab and go. Have two leashes / leads. I keep one leash in the house and one stays in the car. I never have to look for a leash and know that I can transport my dog safely in the car. Prepare a "Doggy Bag". I have a small shoulder bag that contains dried treats and doggy poop bags. If we are leaving the house for a walk I just have to grab the leash and bag. There is also a pocket for my phone and keys, and the strap is long enough that I can wear it across my body. It’s safe and secure, and my hands are free to control the leash. You can also buy a small roll of doggy poop bags on a clip, but I've never needed to take more than two with me. Portable Pet Bowls. The other handy item I keep in the car is a portable pet bowl. These are inexpensive and durable. Mine is made of a water-proof fabric similar to a light canvas, and folds up in the glove-box. After use it dries quickly and I fold it away again. It even has a clip so that I can attach it to the leash or the shoulder bag strap. Having these items prepared means I can jump in the car with the dog and go, knowing we have everything we need ready to take with us. 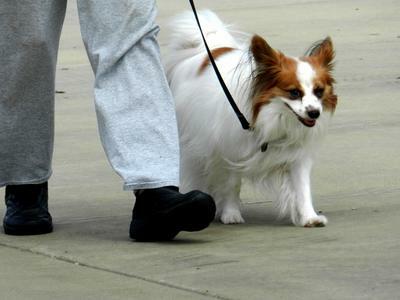 Do you have any tips for outings with your pets? Share them with us here.